"Some dreams are very real, I guess. So real that they get confused with reality. And then when you wake up and look around, you find yourself saying, what am I doing here? How did I get here? What has this to do with what I am and what I want? Then I guess you make up your mind you've had a nightmare and you go crawling to Ma and Pa."
Usually in film and literature, the naive American must go abroad to find old world decadence and aristocratic disdain for God, democracy, and simplicity. Miranda Wells (Gene Tierney) need only travel down the Hudson, from her comfortable but boring Connecticut farm to Dragonwyck, the grand estate of a 19th century feudal lord, the grand patroon Nicholas Van Ryn (Vincent Price). He has procured Wells, a dreamy farmgirl too restless for chores, as a governess for his neglected daughter - but she will become far more than that before her nightmare's over. Joseph L. Mankiewicz, who wrote and directed Dragonwyck (from a novel by the obviously Poe-influenced Anya Seton), doesn't hold back: not only intrigue and romance, but social issues, American history, Nietzschean philosophy, and a dash of mysticism are all part of the picture. Mankiewicz occasionally gets knocked for being more of a writer than a director, and at times the dialogue gets heavy-handed - particularly when politics enters into it. His direction, aided greatly by the master cinematographer Arthur Miller, is graceful and engrossing though not especially unique: I missed the opening credits and didn't know who was behind the camera, though some of the deep staging and rich compositions reminded me of William Wyler. But I've always found Mankiewicz's films thoroughly entertaining and thematically rich. Dragonwyck is no exception, and in fact may be his most thematically rich work, at least of the ones I've seen. Despite the tug of Gene Tierney's beauty, our attention is drawn not to Miranda but to Van Ryn, the fascinatingly complex man at the story's center. The film takes place at a transitional period, when the New York farmers whose families had tended someone else's land for two centuries were finally able to buy the property themselves. Van Ryn of course resists this change, but he is a man born into the wrong place at the wrong time. He'd be far more comfortable perched in a Medieval European castle, overseeing the work of his vassals while brooding over arcane alchemical texts. In the present, bored by his fat, unpleasant wife, he is drawn to the luminescence of his child's governess. But ultimately this attraction has as much to do with propagating an heir as it does marrying for love. Vincent Price's portrait of Van Ryn is masterful in the way it coaxes sympathy for a rather loathsome creature. Of course, narrative film has always had a fondness for elitism: celebrations of the masses grow a bit dull, but give us one unique individual, however haughty and misanthropic, and we're hooked. Van Ryn's transformation mirrors the decline of the privileged class in post-Jacksonian America while also echoing a contemporary change in Price's real-life career. Four years prior to Dragonwyck, Price and Tierney co-starred in Laura. There, Price was almost unrecognizable from the master of horror he would become, with his thick voice buttered up in a Southern drawl, has tall frame pudgy, his face lit up by a corn-fed grin. At the start of Dragonwyck, he is more thin, with an aloof demeanor, and a smile that creeps onto his face before flickering away. Yet he will have gone even further by the end of the picture: bearded, gaunt, eyes lit up by paranoia, he has discovered that refined but decadent and possessed persona which would characterize the rest of his career. Ironically, while essentially driving the van Ryns from America's democratic history, Mankiewicz and Seton are evoking one of the great American writers in their portrait of the House of Ush..., er, Dragonwyck. In fact, Americans - for all their common sense practicality and resistance to elitism - have always had a fascination with gothic darkness and aristocratic decadence. Perhaps that's just human nature, but it's also a weird byproduct of the American Dream: the sense that there's always something more out there, a greater plateau to which we can ascend. If this plateau includes paranoia, tragic melancholy, and the haunting uncanniness of a fever dream, so be it. Of course, if it gets too intense we'll go running back to Ma and Pa.
Van Ryn cultivates a highly romantic notion of himself as someone "apart," and in a shocking twist (if that's not enough of a spoiler alert, stop reading now), van Ryn eventually reveals that his hyped-up consciousness is not simply a result of privilege and a morbid imagination. He confesses to his wife that he is, in her "common parlance," a drug addict. His narcotic of choice is not revealed - unless I missed something - but this is surprising on several accounts. One, that a forties movie acknowledges in such explicit terms the existence of mind-altering substances that cleanse the doors of perception, and two, that Van Ryn's lofty mysticism isn't kept vague and hidden, so that we can write it off as mere self-amusement. 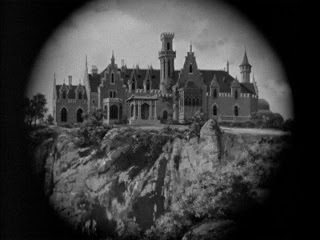 The movie does not take us into Van Ryn's head, though it alludes to his altered state with dark shadows, foreboding music, and ornate set decoration. But that only makes him all the more fascinating, and we're drawn to his mysterious godlike hubris like moths to a flame. In the end, rescue arrives in the form of the all-American Dr. Jeff Turner. (Who knew small-town doctors wore so much make-up...almost as much as Gotham City mayors?) Turner has all the right sensibilities - he sides with the democratic farmers and against Van Ryn's snobbish sense of entitlement. And he's so much less interesting than Van Ryn, who finds his death collapsing into his ancestral chair on a moonlit night. Baronal lords, with their crippled family histories and heightened sensitivities for mystery and mysticism, shall be driven out of America...but not before we take a good, curious look at them first. A really fantastically rich film: and a beautifully written review here that illuminates it. Equally, the novel is not to be missed: Anya Seaton is now celebrated for the accuracy of her historical research - even if she uses the gothic melodrama mode. Many thanks! Thanks, glad you enjoyed it! I will have to check out the book.